This has been a very quite weekend, and I have to say I have thoroughly enjoyed it. Breanna and Wes celebrated their first Valentines Day together yesterday since we were not going to be in The Villages on Sunday. They are so cute and I am so happy Breanna has found such a sweet first boyfriend to be so silly with. 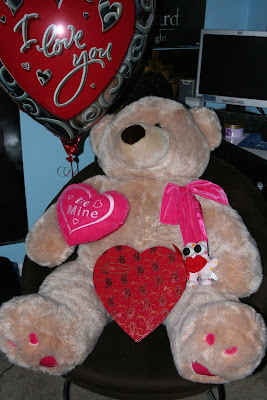 Here is a picture of what he did for her, the bear is bigger then her! He totally spoiled her! Breanna and I got up yesterday and went to see Dear John with Wes, Steph and Russ. It was so good even Breanna said we have to get it when it comes out on DVD. It will go right into the "chick flick" section of our collection and will be pulled out and watched quite frequently I believe. Loved the movie as well as the soundtrack which we are now the proud owners of and will be played in the car everyday this week I fear! So if you haven't gone and seen it yet it is definitely worth going to the movies to see. Came home from there and got in a little nap, boy that was nice and something I really seem to be enjoying when I can sneak them in, lol. Then downloaded The Time Travelers Wife and watched that last night. It was ok, but not one I will be adding to my collection. Glad I waited for that to be out of the movies. Then watched Because I Said So for about the 5th time, it still makes me laugh and cry, I need to find this one on DVD because I truly love this movie. Today being Valentines Day and all, I totally took advantage and used it as an excuse to have a lazy day!!! That was the best present I could have gotten, took another little nap and just goofed around doing whatever I wanted to. So nice to have a day like this because we are always on the go and rarely have just a day at home with nothing planned. This week will be a busy one preparing for Donna Downey to visit the store over the coming weekend. Looking forward to the creative energy! I sure hope everyone else is enjoying their weekend and spending it with people you love. Hugs to all my friends and Happy Valentines Day! Sounds like a wonderful weekend! I was going to make Andy a special dinner but we were lazy all day and he said delivery would be just fine! I wuv him! ;) I still haven't seen Dear John and so hope to see it soon. Hugs friends!